Lovely three bedroom house with recently refurbished bathroom and new kitchen with large gas hob and oven. Open plan living with vaulted ceilings flow to huge deck with fenced grounds for children. Gas central heating for winter warmth. Single garage for an average sized car with internal access to the house. Located in central Taupo, a (nearly) flat 15 minute walk/2-3 minute drive to the lake or town. A short walk away from reputably the best Fish and Chip shop in Taupo and other local shops. - Strictly no smoking inside the house. Please respect our holiday home by leaving it tidy. Families preferred. A few quiet drinks are fine, but if you are wanting a house to party in, then sorry but this is not the house for you. We would appreciate our guests leaving the house tidy on departure. If you are staying for two weeks or longer, our housekeeper will come in at a mutually convenient day/time to change the linen etc each week. Bathroom has a bathtub as well as a shower and vanity. Toilet is seperate. We have a gas underfloor heating system that keeps the house nice and warm in winter. Beds will be made up before you arrive with sheets/blankets/pillows. Spare blankets are kept in the top of the wardrobes in each bedroom. Washing machine in the laundry area that guests are welcome to use. We have off-street parking for two cars in front of the garage, and a single garage for guests' car. Towel and facecloth will be at the bottom of each bed. Fully equipped kitchen with gas hob and oven. Dishwasher, fridge/freezer, microwave,and plenty of crockery/serve-ware/cutlery/pots and pans etc. Just what you would expect in a normal kiwi kitchen! Wooden table with 6 chairs. There is also a breakfast bar with 3 bar-stools for informal dining. Please bring your own sky card for the sky decoder. Located in the wardrobe of the main bedroom are a selection of books and magazines. There is a selection of children's toys/books in the wardrobe of the bedroom with the two single beds. Fenced backyard for children to play on the grass. Wooden deck off the lounge/bedrooms with an outdoor table and chairs for 6 as well as a bar leaner and 4 bar stools. Large umbrella for those hot sunny Taupo days! We are 4 minutes by car from Tauhara Golf course, or 12 minutes by car from Wairakei International golf course. This is our family holiday home which we are happy to share. It suits a range of groups from families to groups of friends. View of Mount Tauhara from the front of the house. Mount Tauhara has the reputation of forecasting the weather, and is an important part of the Maori legend of Mount Pihama and the mountains who fought over her. We are close to the golf course, and the motor racing (not near enough to be noisy!). A lovely warm house in a quiet area that will feel like home. Lovely home, we enjoyed our stay and will love to go back one day. So much to do in Taupo. Very tidy, well equipt. Comfortable and warm. 2nd time we have stayed at this property and we will happily stay here again in the future. The place is really comfortable, clean, tidy and well equipt for an enjoyable stay. Had a great stay . House was clean and tidy had everything we needed . The property had everything we needed. If we are in Taupo again, this is where we'll stay. Great house. Really close to everything in Taupo. Very spacious and well stocked with anything you need. Worked great for our family of 2 adults and 4 kids! 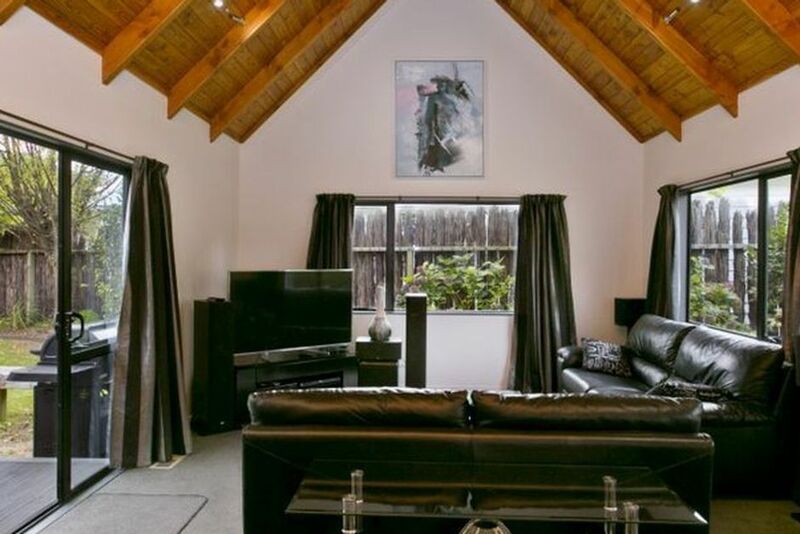 Located in a quiet suburban area close to shopping centre/takeaways/petrol station, and only a short 2-3 minute drive/15-20 minute walk to town centre or Lake Taupo. View of Mount Tauhara from the front of the property. Within an hour's driving distance to the three mountains making up the volcanic plateau for hiking/tramping/skiing or just playing in the snow in winter. Easy driving distance to rivers to fly-fish for trout (or go with a fishing guide) and the golf courses around Taupo.